Due to a lack of carcasses in Chinese rivers recently, Chinese officials proudly announced yesterday that authorities working along the Fuhe River in the Hubei Province had successfully removed more than 100,000 kilograms of dead fish from a roughly 40 kilometer stretch of water in the past day or so. The waters of the Fuhe River in this area turned an eerie silver color due to all the deceased fish floating to the surface. Chinese officials believe they have traced the problem back to a chemical manufacturing facility in Yingcheng located outside the city of Wuhan. Authorities took water samples from a discharge pipe from the Yingcheng facility and determined that they contained ammonia concentrations in excess of 190 milligrams per liter… when ‘natural’ ammonia concentrations in the environment usually measure around 0.2 milligrams per liter (with some naturally occurring concentrations reaching a little over 10 milligrams per liter) according to the World Health Organization. The company responsible for operating the plant received orders from the Government to suspend all operations until the cause of this pollution — and probably several other environmental nightmares not, yet made public — get corrected. This massive killing off of fish as a result of environmental pollution comes on the heels of 1,000’s of pig carcasses floating down a different river in China earlier this year. In a related news story, China has some SERIOUS pollution issues that it needs to deal with… and needs to deal with QUICKLY. It’s large population and recent (practically unbridled) economic growth (aka: economic explosion) over the past few years (seem to) have greatly outpaced the country’s ability to manage industrial waste streams and protect the environment. Now before some of you think we have jumped on the ‘pick on China bandwagon’ that has circled around once more, please try to remember that practically NO modern, industrialized country on this planet made the transition from mostly agricultural to highly industrialized without sever growing pains — and instances of mass pollution. Oh, and as for all the recent allegations of bribes going to Chinese officials if they would turn a blind eye to the illegal dumping of chemicals and waste products into the environment, well, please highlight an example of a fast-growing nation streaming towards mass industrialization that did or does not have that same problem. No, we do NOT condone the blatant disregard for environmental standards that we have witnessed in China recently and NO we do not intend to DEFEND China’s history of telling the rest of the world to go scratch while it exploits and pollutes its natural resources in spite of the rest of the world’s pleas for China to show moderation in the way it utilizes those resources. We DO hope that the world will take note of this tragic loss of aquatic life in the Fuhe River and press China to enact (and enforce!) stricter environmental regulations while holding past offenders responsible for the many environmental messes they’ve created by coercing them to clean up those messes. You may read more on the horrific Fuhe River environmental debacle here. Question: Instruction Manual for Ammonia Test Kits? Today’s question comes from ‘Gordon’ and he had a question about replacement (updated) manuals for ammonia test kits. From the sounds of things the test procedure may have changed and his older manual lacks the added steps for the testing. Unfortunately, as you will see, Gordon neglected to tell us which ammonia test kit he purchased, though we suspect he has one of the eXact Micro 7+ meters from the makers of SenSafe and WaterWorks water testing products. I have revision 08/26/09 booklet and have just pouchased some ammonia test kits but my instructions do not cover the use of the added liquid, how can I get an up to date insrtuction booklet. If we guessed correctly, then Gordon needs to take a look at this page because it contains a link to the newest version of the manual for the eXact Micro 7+. Take a look at page 12 in particular, Gordon. Best of luck in all your water testing adventures! In our last posting we mentioned a relatively new water testing meter called the eXact Micro 8 because of its ability to test for both free dissolved iron and total iron. We since have received a number of emails from our readers asking for more information about the eXact Micro 8. Below you will find a list of the water quality parameters that this meter will test along w/ the meter’s detection levels for each parameter. While this meter seems to offer tremendous promise for water quality professionals, we do not think it will work well for the average homeowner who will more likely have more of a need to test for things like free & total chlorine, (standard) pH and copper than they would ammonia, cyanide and phosphates. This meter, we feel, will have a lot more popularity with water and waste water professionals who, we hope, will do their due diligence and test for things like ammonia, cyanide and phosphates in drinking and process water. So… What meter can the average homeowner use to test drinking water? If the convenience, repeatability and accuracy of a water testing meter appeals to you, then take a look at the predecessor to the eXact Micro 8: The eXact Micro 7+ Water Testing Meter. 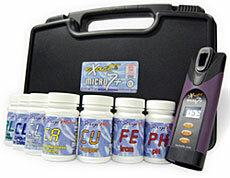 We have yet to find a simpler, more versatile water testing meter than the eXact Micro 7+ Water Testing Meter. It can test for Total Alkalinity, Bromine, Calcium Hardness, Free Chlorine, Total Chlorine, Copper, Ozone, Permanganate, and pH directly — providing you use the correct reagentstrip. 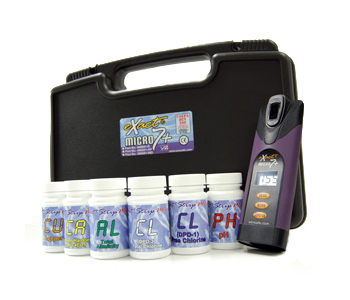 With the use of optional reagentstrips and a conversion-lookup table, the eXact Micro 7+ Meter has the ability to test water for these other parameters, too: Ammonia, Bromine, Chloride/Salt, Chlorine Dioxide, Chromium Hexavalent (Chromium VI), Copper, Cyanuric Acid, Fluoride, Iodine, Iron, Low Range Total Hardness, Manganese, Nitrate, Nitrite, Ozone, Acid pH, Alkali pH, Potassium, Sulfate, Sulfide, and Turbidity. Ever wonder what is in the water coming out of your tap or out of that sprinkler at the golf course? The chemists at the Mulberry Treatment Plant Laboratory have those answers. Beakers, test tubes and microscopes are part of the tools three chemists use at the lab at 340 Mulberry Ave., every single day. The tests help ensure that the quality of water from the city’s water and wastewater treatment plants are meeting environmental and safety specifications. But what started as a side project to save a few dollars on testing has become a revenue generator for the city in the last several years as more than a dozen agencies across Arizona, including Kingman, Yucca, Havasu Heights and Parker, use the lab for testing. For the fiscal year 2009-2010, lab contracts generated $33,272 for the city, according to the city wastewater division. After reading the full article several times we still find ourselves wondering WHY a local newspaper would write an article about the municipal water testing lab. At first we suspect ‘human interest story’, but then the article steered clear of actually talking about the staff so we quickly realized the error of our thinking. 5 Useful Tests in One! Naturally our NEXT suspicion dealt with politics. Not sure who has entered the race for office in that town this year, but we suspect that supporters of the incumbent politicians in Lake Havasu had something to do with the writing of this glowing review of the municipal water system’s performance AND its ability to earn a few extra bucks for the city. We only point out the possible political motivation for this article because it may illustrate a sometimes forgotten reality: Water Quality Issues Often Get Diluted by Politics! Protect yourselves against evil, self-serving political maniacs! Wow. We impressed ourselves with how ‘radical’ and ‘revolutionary’ that sub-heading sounded. If left to our own devices we may someday start a revolution! We wrote those words to get your attention… and call your attention to the fact that you, like everyone else — ourselves included — have sole responsibility for keeping an eye on the quality of the water around you. No government official will swoop down out of the sky like a water testing super hero and test your drinking water for you! So, as usual, we suggest periodic testing of your water to make sure no unexpected contaminants have accidentally found their way into your water supply. Oh, and if you already suspect a problem with your water, please defer to the expertise of a qualified water testing lab such as National Testing Laboratories. It’s your water, your health… and ultimately your life! 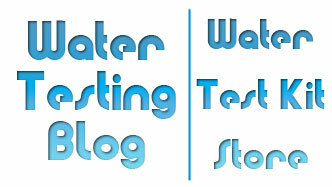 Question: Are All Water Test Meters Complicated? My company does a lot of plumbing work for residential and commercial customers. Not all the time, but many times we get asked to test the water once we finish a job. I see a lot of test kits that use drops and those test strips on the market, but I want to use something a bit more professional like a meter of some sort. All the meters I’ve seen out there that test for a bunch of parameters have a ton of buttons, vials, powders and an instruction manual you could use to knock out a cow. Do they make a multipurpose water testing meter for the simple guy? Thanks for your help and I love the site. Lot of good info here! Stop it, Kyle, before you make us blush! To answer your question directly, yes you can find a reliable water testing meter made for the ‘simple guy’ and no you will not have to attend night school just to figure out how it works. The eXact Micro 7+ Water Testing Meter offers extreme versatility, has only one button to worry about, does not use vials, and comes with a handy, compact manual barely capable of killing a fly. Now Kyle, if that looked like too much work, or like it involved way too much ‘technical stuff’, then you may as well hang up your water testing hat(?) and send all your samples out to a place like National Testing Labs ‘cuz testing water in the field does not get any easier than it does with the eXact Micro 7+ Water Testing Meter. 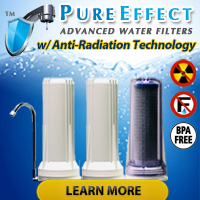 Additional parameters — Ammonia, Chloride (as NaCl), Chlorine Dioxide (DPD-1), Chromium Hexavalent, Cyanuric Acid, Fluoride, Hydrazine, Hydrogen Peroxide (Low, Mid and High Range), Iodine (DPD-1), Iron (Fe+2), Total Iron (Fe+2/Fe+3), LR Total Hardness (as CaCO3), Magnesium, Manganese, Nitrate (as NO3), Nitrite (as NO2), pH (Acid and Alkali), Potassium, Protein (as BSA), Sulfate, Sulfide, and Turbidity. 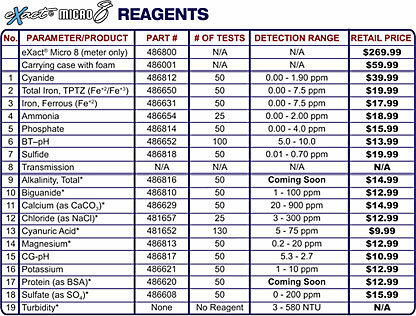 Kit includes conversion chart for these parameters. Every once in a while we get a request for information related to testing pond water and aquarium water. 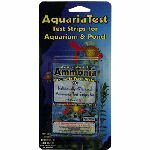 Today we bring news of a product, AquariaTest™ Ammonia, that makes testing the ammonia levels in pond and aquarium water very easy. 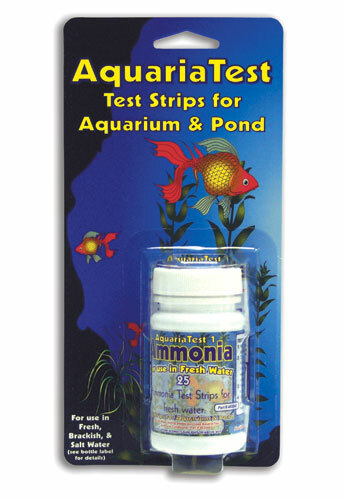 Ammonia Aquarium and Pond test strips provide a water quality testing alternative to older testing methods which required the use of chemicals in liquid, powder, and/or tablet form. Ammonia AquariaTest™ also shortens testing times and makes it easy for anyone, novice or expert, to test the ammonia levels in their water. As an added feature, the AquariaTest™ Ammonia will also work in salt (or brackish) water*. Using supplied pipette, fill one of the supplied vials half full (3 ml) with water. * — Instructions for testing ammonia levels in brackish and salt water included in the test kit. Illegal Marijuana Growers… And Water Quality? News reports continually talk about the ways in which illegal narcotics destroy lives, break up families, ruin careers, take lives, and cost taxpayers millions of dollars each year. Have you ever heard of illegal marijuana growers destroying the environment, though? We had not, either, until just now. Quite frankly, when we think of pot growers, we envision hippies growing a few plants for themselves and their friends… and we also believe that most hippies care what happens to the Earth and would not want to see it harmed in any way, shape or form. Too bad our little fantasy bears little resemblance to reality! It seems as though the money-hungry, drug dealing folks growing illegal marijuana don’t consider the environment (at all) and cause serious harm with their sloppy farming techniques and extremely poor waste management policies — meaning they leave open bags of fertilizer and pesticides laying around and leave the trash they generate (typical garbage AND human waste) behind once they have harvested their illegal marijuana crops. Sometimes growers use rural private property, as in Belleview, unbeknownst to the land owner. But most of the gardens are found on U.S. Forest Service, National Park Service or Bureau of Land Management land. It’s problematic from the public safety standpoint, and also an environmental one. Grow sites tear up the ground, use highly-toxic chemicals and leave behind months worth of trash in remote areas where water quality and wildlife are affected, officials say. Even when gardens are raided, the damage to the environment has already been done. The piss poor and quite irresponsible antics of illegal marijuana growers result in chemical runoff often containing pesticides, ammonia, nitrites, nitrates, bacteria, etc. All of which throw off the surrounding ecosystem’s delicate natural balance and undoubtedly harm or kill off indigenous plant and animal life. Several people have asked why we have not talked about water… in aquariums. No particular reason, really, other than not enough people had asked for that sort of information — until now. An UNhealthy aquarium requires next to no maintenance. Simply add water to the tank, throw in some fish, wait for fish to die, scoop up dead fish, re-stock tank with live fish, and repeat the last two steps until common sense kicks in. Eventually people catch on to the fact that an aquarium needs more attention than just adding fish and dumping in food once in a while. It takes some people longer than others to figure that out, true, but we can discuss that topic another time. For right now let’s stick to the topic at-hand: Testing Aquarium Water so that your fish don’t keep going belly up. As you can see from the above test kits, you will have to test for a number different water parameters if you want to keep your fish healthy, happy and alive. 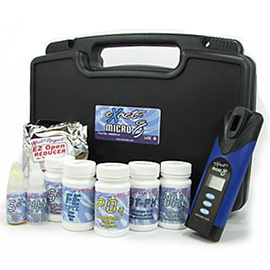 Thankfully most aquarium test kits these days come with easy-to-follow instructions and the average person can complete the testing in just a few minutes. Ammonia Levels — As disgusting as it sounds to us, fish live in their own waste products, one of which is ammonia. Excessive amounts of ammonia result in respiratory problems for fish and if left untreated the fish will eventually stop breathing and die. 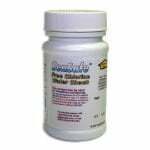 Chlorine/Chloramines Levels — Extremely toxic to fish and pretty much all aquatic life even in small amounts. When adding fresh water to an aquarium, always make sure to test for and remove any and all traces of chlorine and chloramines. Nitrite Levels — When ammonia breaks down it forms nitrites, another very toxic compound which can cause respiratory distress in, and eventually the death of, fish. pH Levels — It ought to come as no surprise that fish don’t want to swim around in extremely acidic or basic water any more than you would want someone pouring hydrochloric acid or concentrated lye onto your skin. One thing to remember, though, about pH: Not all fish prefer the exact same pH so when choosing your fish, read up on their preferred water conditions — or risk killing some of your fish slowly and painfully.